Cilternsaete (Anglo-Saxon: “Chiltern settlers”) is one of the old Anglo-Saxon tribal divisions of England, recorded in the 8th century “Tribal Hidage” which list a number of regions subject to the kings of Mercia and their assessment for tax purposes. That pre-dates the division of much of England north of the Thames into the shires during the 10th century reconquest of the Danelaw which were until recently still the basis of local government, such as Buckinghamshire, Hertfordshire, and Bedfordshire. Cilternsaete was one of many Middle Angle tribes that were absorbed by the growing kingdom of Mercia during the 7th century. As the name suggest, it was based on the Chiltern hills, running from the Bedfordshire plain in the north-east to the northern bank of the Thames in the south-west. During the 9th century, much of this area would have been forested. In the Tribal Hidage, Cilternsaete was assessed at 4,000 hides. 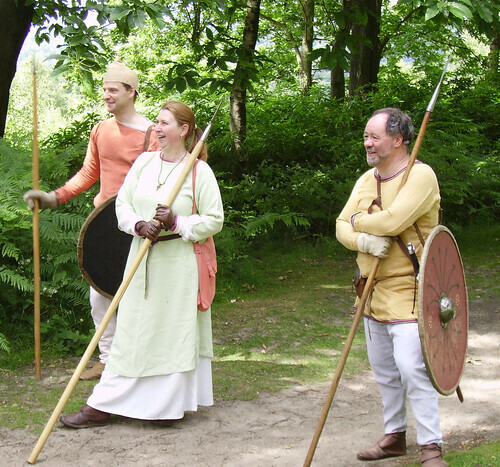 As a hide of land was enough to support a ceorl’s family, and 5 hides was the minimum land holding for a thegn (and was also the rule of thumb for the amount of land needed to support a warrior for the fyrd – not a coincidence! ), it is clear that the Cilternsaete in the Dark Ages Society are only a very small part of the total population. We hold land from the Abbot of St Albans in the area of Redbourn and Sandridge. We are close to the old Roman road of Watling Street, and a little west of the River Lea – fortunately placing us under Mercian control when the Danelaw is recognised by the Peace of Wedmore. Part of our land-holding arrangement with the Abbot is that we provide men to fulfil the three common dues that the king can call upon – bridge-work, fortress work, and fyrd service. Herewulf Aescferthsunu: thegn, holding 10 hides of bookland at Redbourn from Abbot Wulfnoth. Godwin Offansunu: geneat, holding 3 hides of loanland at Redbourn from Herewulf. Guthwald: thegn, holding 5 hides of bookland at Sandridge from Abbot Wulfnoth. Wulfruna: geneat, who also holds land. Herewulf Thegn leads the Cilternsaete, and is particularly famed for the fine banquets he hosts. Guthwald is Herewulf's closest advisor, and was recently made a thegn by Abbot Wulfnoth of St Albans.